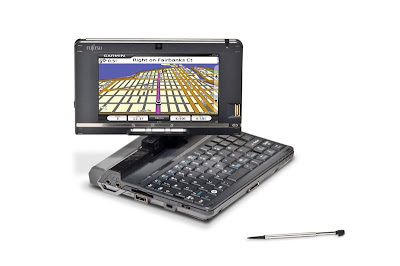 The FCC test showed that one with the FM transmitter but no where in the specs on Fujitsu's website do they mention it. I think the final release they may have nixed the FM transmotter. Anyone know for sure? I have one ordered so should have it by end of next week so I guess i'll find out. I received mine today (minutes ago) and while I haven't finished setting up, so can't comment on the FM transmitter, I can clearly see that the integrated "fold-out" GPS antenna is gone, replaced by a plug in version. Great! thanks for info... any unboxing pix or first impressions? No pics, too swamped with work, but first impressions: the glossy is GLOSSY and has a large subdued Fujitsu logo on about 1/4 of the cover...it looks more like a "luxury" finish that one would expect in a cell phone. The resolution is amazing, it almost looks like a fake screen from a store, though there is one dead/red pixel. It runs really quiet, and heat is comfortable (for the short time I've been working with it). The tablet accuracy is very good, but you have to touch with a little more force than I expected. I'm not sure how I feel about the GPS replacement. I don't think that'll be a high priority app for me, but if it were, I think I'd have favored the fold out design. (particularly since that's what's shown on the site). There is an odd warning on the package that handling the power cord may cause cancer...perhaps that's standard now, it's been a couple years since I've bought a new machine. Also, the navigation button works fine, but the placement relative to the buttons will take some getting used to. They do provide a replacement navigation button, so it makes me question durability. They do not provide a replacement stylus. I have a little review and some pics on a blog here. The FM transmitter has been omitted from the U820 in the US. Also the add-on antenna for the GPS isn't needed. Only if you have poor reception. I rode around town without it and it worked great. Better not to have some antenna sticking out of it if you don't need to I guess. Is it ok to link you unboxing post? Could you also open the bottom door to see if there is free pci-e slot? Tim, how is the wifi strength on your machine? I sent mine in to have it checked out, it was so low something had to be broken. I got a laptop battery from http://www.bestebuy.o.uk/ for my Dell Latitude notebook. My old one lasted just 1 hour after just about a year of use. Needed another one, and now things are back to normal. Got the machine back, killed bluetooth (and GPS just for good measure) in BIOS...still unable to pick up more than one AP (using the ath9k linux driver in 2.6.27) I will try to find any patches that may provide better performance. Can gps be installed in u2010 unit from Japan? According to some of the other information I've found on the web, the U2010 had what looked like a SIM card slot that wasn't hooked up. Considering the U820 should be coming out in Q1 2009 with 3G support, does the SIM card slot look usable? And does it look like it's hooked up to the PCI-E slot that normally has the GPS card in it (I assume that the PCI-E slot is hooked up to the antenna, which would also be used for 3G)? So, re:my earlier posts about AP ident, looks like I'll be trying an ext antenna, but the drivers for wifi are really lacking. ath9k thankfully has a lot of attention directed to it, but just an update in case anyone is in the same boat: I implemented the 2008-12-10 version of ath9k in compat-wireless, and have no change in ap identification, however i have found some issues with aircrack. if networkmanager is left running, the channel keeps hopping with airodump, so it has to be killed, but if it is killed, any injection causes a total system lockup. if it's left running, aireplay-ng -9 reports injection working fine, fakeauth is fine, and arpreplay works, but never sees an ARP, so never starts injecting. so we need either/both changes to ath9k and aireplay. maybe a driver patch from aircrack would be the best solution. so i've opened a ticket outlining this data there. don't know if anyone is watching this thread, but aircrack does work on the u820, it just needs python and scapy installed. See ticket 558 on the aircrack bugtrac for detail.